This book is intended to create a path for the readers to deepen and expand their spiritual abilities. 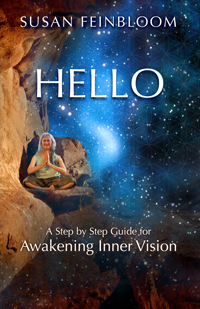 HELLO covers many varied, detailed and sequential topics on Spiritual Awakening and Inner Vision. Susan Feinbloom is a unique and gifted psychotherapist with a strong focus on spiritual and psychic abilities. For the last thirty years she has been weaving meditation and clairvoyance into her practice, looking beneath content, beyond stories to underlying truths, revealed through the spiritual anatomy. 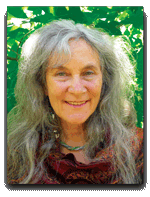 She teaches classes in clairvoyance, meditation, the chakras and shamanic techniques, and she conducts trainings in her methods for psychotherapists. Her classes are currently held in New York and California. from Mother Earth and the Heavens. use it always – shout it to the heavens. to infinity and cosmic consciousness. infusing it into my work, sprinkling it back into the universe." Our deepest fear is that we are powerful beyond measures. You are a Child of God, your playing small doesn't serve the world. You were born to make manifest the Glory of God that is within us."